Concrete maturity is an index value that represents the progression of concrete curing. It is based on an equation that takes into account concrete temperature, time, and strength gain. Concrete maturity is an accurate way to determine real-time strength values of curing concrete. Early, rapid and accurate in-situ estimation of the compressive strength of concrete is one of the major challenges for the concrete industry. A practical solution for such challenges can prevent multi-million dollars of extra annual investment for construction industry and owners of civil structures since annual global production of concrete is estimated at 3.8 billion cubic meters. An accurate and reasonable in-situ estimation of the compressive strength provides the opportunity to optimize the concrete mix design as well as optimizing the formwork removal time. The optimization of mix design affects the consumption of raw materials (e.g. cement and aggregates) and alternative materials (e.g. natural pozzolans and supplementary cementitious materials like fly-ash and silica-fume). Considering the high volume global consumption of concrete, this could, in turn, effectively optimize the consumption of resources and reduce a great extent of CO2 and toxic materials (emitted during the cement production) into the atmosphere. The maturity method is a convenient approach to predict the early age strength gain of concrete, using the principle that the concrete strength is directly related to the hydration temperature history of cementitious paste. The maturity concept for estimating the strength gain of concrete is described in ASTM C1074, Standard Practice for Estimating Concrete Strength by the Maturity Method. This method can potentially address many immediate challenges facing the concrete industry such as predicting appropriate time for formwork stripping and post-tensioning, especially at low temperatures while the strength development of concrete is hindered; and optimizing concrete mix design and concrete curing conditions (e.g. concrete heating at low temperatures or surface protection in hot-dry weathers). Lack of an accurate estimation of strength at early ages of construction is twofold: contractors either wait too long for next action (e.g. stripping formwork) which is costly due to delays in completing the project, or they act prematurely which could cause the concrete structure to crack - that would lead to future durability and performance issues - or even structural collapse. 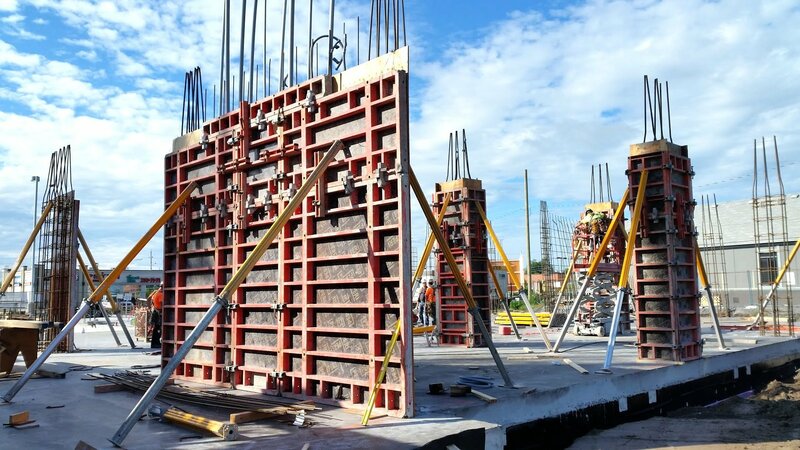 In most construction sites, field-cured concrete samples are tested to strength at various ages during the first week since concrete is poured, in order to make a decision on formwork removal. ASTM C873 offers a test method for cast-in-place cylindrical specimens. These specimens can be removed later for measuring the compressive strength of concrete in the lab. Usually, if the concrete reaches 75% of its designed strength, the structural engineers allow for the striping of forms. The problem, however, is that only one specimen is crushed for strength estimation. This is not necessarily accurate. This method is limited to use in horizontal and thick concrete elements like slabs. In addition, the construction crew is usually on the job site while they are waiting to hear about the compressive strength result from the lab. This adds to the cost of construction and its uncertainty decreases the efficiency of the construction. Although alternative methods such as concrete maturity testing exist, there is a traditional resistance to utilizing them for most concrete projects. Except for specific projects, the concrete industry shows interest in the commonly used compressive strength test. This is mainly due to the upfront cost of concrete mixture calibration for maturity curves, and lack of expertise for the installation of concrete temperature sensors, data collection and analysis. Such approaches to compressive strength evaluation may cause concrete contractors to make conservative decisions, face more complicated technical problem (e.g. delay in formwork stripping, and unnecessary long-term curing and surface protection), and spend more financial resources. As a non-destructive testing, the concrete maturity testing method may be a reasonable candidate to fill this gap. In comparison to most on-site non-destructive technologies (e.g. Schmidt Hammer or Ultrasonic Pulse Velocity), the privilege that the maturity method stands on is that, the procedure for estimating the compressive strength would be objective and qualitative once the maturity curve is developed and adopted. This technical article describes how the maturity curve is developed, and how it is applied for on-site estimation of the compressive strength of concrete. Please watch a short video on concrete maturity testing here. 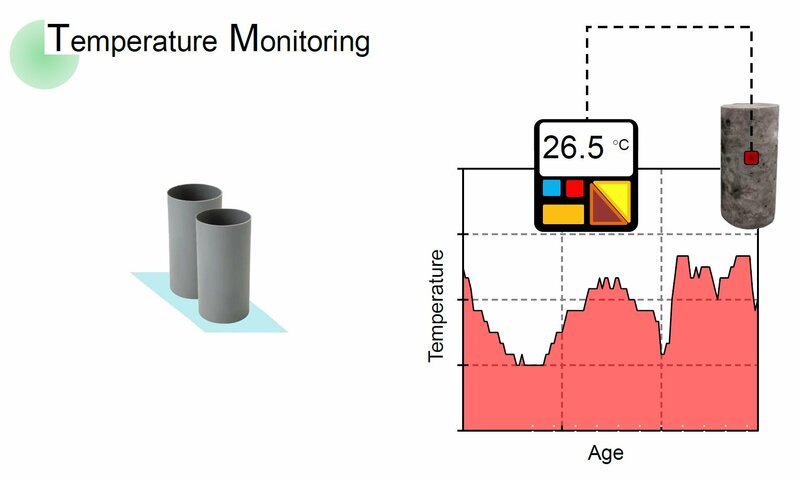 Interested in learning about how we use the maturity method for our SmartRock wireless sensors? Read all about it HERE! What is the principle of the Maturity Method? Maturity method is a relatively simple approach for estimating the in-place compressive strength of concrete, specifically at early ages less than 14 days. Once the maturity curve is developed in the laboratory for a specific project, it can be used for on-site estimation of compressive strength of concrete in real-time. The maturity method is governed by the fundamental assumption that a given concrete mix design poured during course of a specific project has the same compressive strength when it has the same “maturity index”. It means that a given concrete mix design, for example, may reach the same compressive strength after 7 days of curing at 10 °C when it is cured at 25 °C for 3 days. The maturity method based on the ASTM C1074 is the most commonly used method to estimate the in-situ strength of concrete. ASTM C1074 provides two maturity functions: 1) Nurse-Saul function; and 2) Arrhenius function. Based on the Nurse-Saul method, there is a linear relationship between the maturity and the temperature in real time. The underlying assumption is that the strength development in concrete is a linear function of hydration temperature. Equation 1 shows the relationship between maturity and hydration temperature history. Where: M(t) is the maturity index at age t; Ta is the average temperature during time interval ∆t; T0 is the datum temperature. ASTM C1074 provides a standard procedure to find the datum temperature for a specific mix design. However, most of previous studies suggest a practical estimation of the datum temperature that is between 0 °C and -10 °C. Indeed, this is the temperature at which the hydration of cementitious paste stops; hence the strength development of concrete ceases. Unpublished results by Giatec Scientific Inc. show that this temperature resides within an interval between 0 °C and -5 °C dependent on the concrete mix design. The second approach is the Arrhenius function that assumes there is an exponential relationship between the compressive strength and hydration temperature. The maturity index is defined in form of an equivalent age at a reference temperature. It means the actual age should be normalized to the reference temperature in order to estimate the compressive strength. This function needs a value of activation energy that can be determined as the procedure detailed in ASTM C1074. The Nurse-Saul function is relatively simpler compared with the Arrhenius function. How is the maturity–strength curve adopted via the Nurse-Saul function? 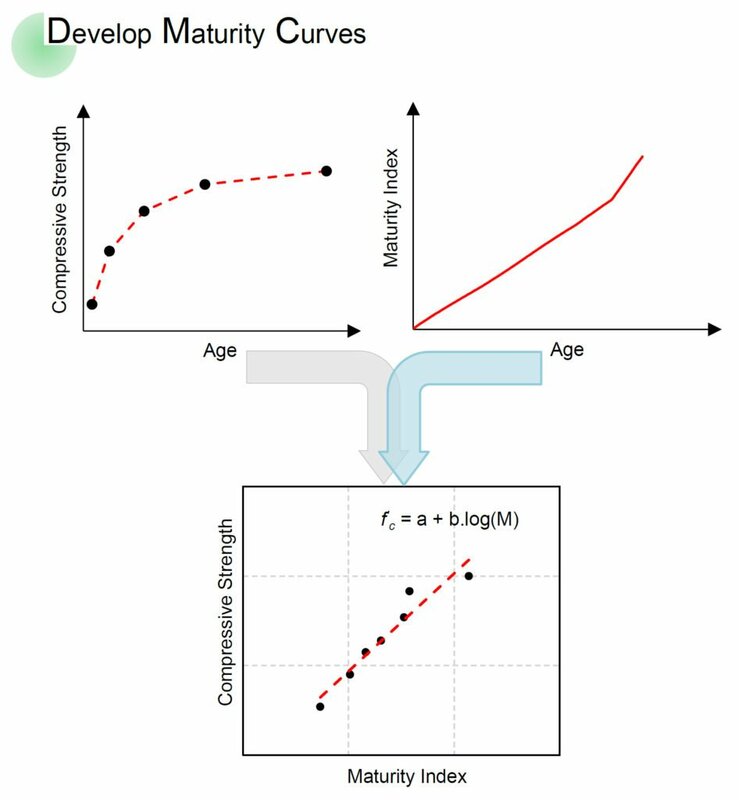 As detailed in ASTM C1074, there is a step-by-step guide for developing the maturity curve, and for estimating the compressive strength. These steps are described as follows. The maturity-strength curve represents the relationship between maturity index and compressive strength for a specific concrete mix design, adopted in the laboratory. To do so, adequate concrete cylindrical specimens should be casted, and then stored in the semi-adiabatic condition for curing. Certain number of concrete cylinders (i.e. at least two concrete specimens) should be equipped by embedded temperature sensors for recording the hydration temperature history. The compressive strength of concrete is measured at ages of 1, 3, 7, 14 and 28 days. The maturity index is calculated at strength testing times using Equation 1. Then the best curve will be fitted for the strength data versus maturity index data. It should be noted that it is important to test the concrete mix design that will be the same as that used in the construction project. Any deviations from the original mix design (such as water to cement ratio, cement content, etc.) will reduce the accuracy of the maturity method to estimate the compressive strength. Once the maturity – strength curve is developed, it can be used to estimate the in-place concrete strength using the hydration temperature history. To do so, the temperature history of the concrete elements should be recorded after pouring using embedded sensors at the locations that are generally critical in term of exposure conditions, curing and structural requirement. Routine quality control tests should be performed to ensure the accuracy of the maturity – strength curve. These controls minimize any error in the estimation of in-place strength due to inherent limitations of the concrete maturity testing method. Using a datum temperature (for the Nurse-Saul function) that is not representative of the concrete mixture can result in incorrect estimation of strength. Several maturity meter devices have been developed that can measure the hydration temperature of concrete in real time. Most of these devices such as Flir Intellirock, Command Center, and Concure iDrop can calculate maturity index and predict the compressive strength if the maturity – strength curve, datum temperature and any required information are developed. Most of these devices include a temperature sensor embedded into the concrete elements that is plugged in the data logger via an electrical cable. Alternatively, a simple thermocouple could be embedded in concrete for temperature monitoring using a connected data logger. The data should then be extracted and used to calculate the maturing index and use it to estimate the concrete strength from the maturity curve.